The European Southern Observatory designated six Photo Ambassadors, who share their dazzling view with the world. On a moonless night, the sky above the Atacama Desert in Chile is so dark that the brightest visible star – a star so bright we could see it from cities – would cast your shadow. The Atacama Desert is the driest desert on Earth, free of clouds most nights of the year and has no light pollution or radio interference from cities. It is here that the European Southern Observatory (ESO) operates three observatories: Paranal, La Silla, and Llano de Chajnantor. The ESO has designated six astrophotographers as Photo Ambassadors for the observatories. In other words, ESO assists these photographers whenever possible in taking images of ESO sites and the Chilean skies. Take a look at samples of their work, below, and you’ll understand why. 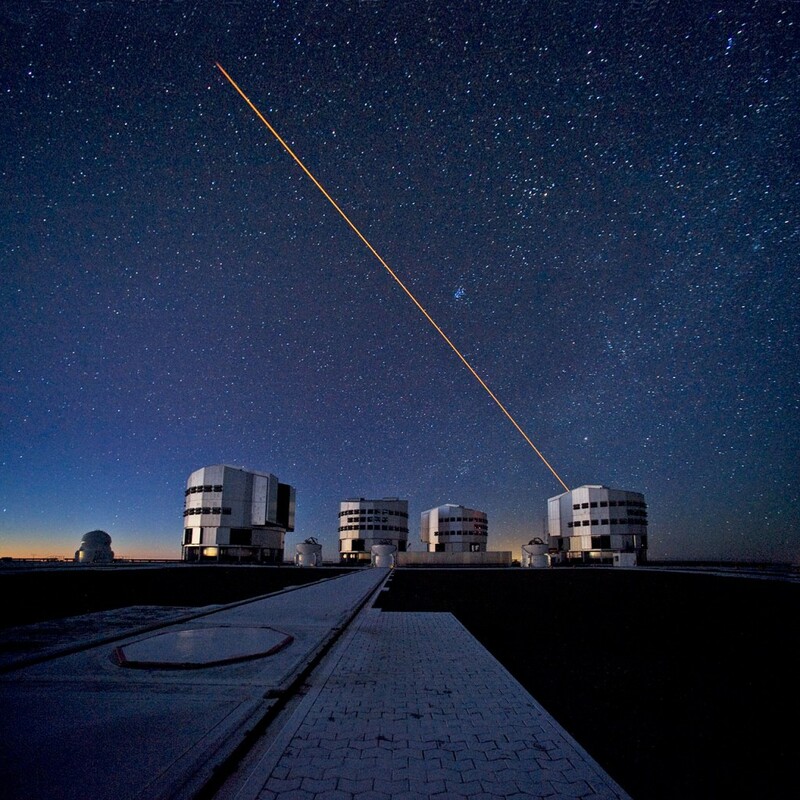 Stéphane Guisard, an optics engineer at Paranal, took the time-lapse video above. It shows the Very Large Telescope (VLT) in action. The VLT is the most advanced optical instrument in the world — it is actuallly made up of four units, which can be used individually or together. Each unit can detect an object, in a one-hour exposure, that is four billion times fainter than what the unaided eye can see. The movable part of each unit weighs as much as a loaded jumbo jet but is so perfectly balanced on its bearings that it can be moved by hand. The laser in this video is creating an artificial “star” by exciting sodium atoms in the upper atmosphere. The “star” serves as a reference point for an adaptive optics system, which corrects the blurring effect of atmospheric turbulence on images (a computer can tweak a distorted image if it has a near-perfect reference point near the object being viewed). By using the laser, astronomers can acquire images almost as sharp as those taken in space. The image below was taken by Serge Brunier, a Parisian who has received many awards for his books and his popularization of science. This image shows the VLT units — named (from left to right) Antu, Kueyen, Melipal, and Yepun — as well as four smaller auxillary telescopes, which move into position along tracks like the one visible in the foreground. The blue smear just to the right of the laser is the Pleiades open cluster. The VLT unit named Yepun houses the laser that creates reference “stars” when there isn’t a bright enough real star in the field of view. 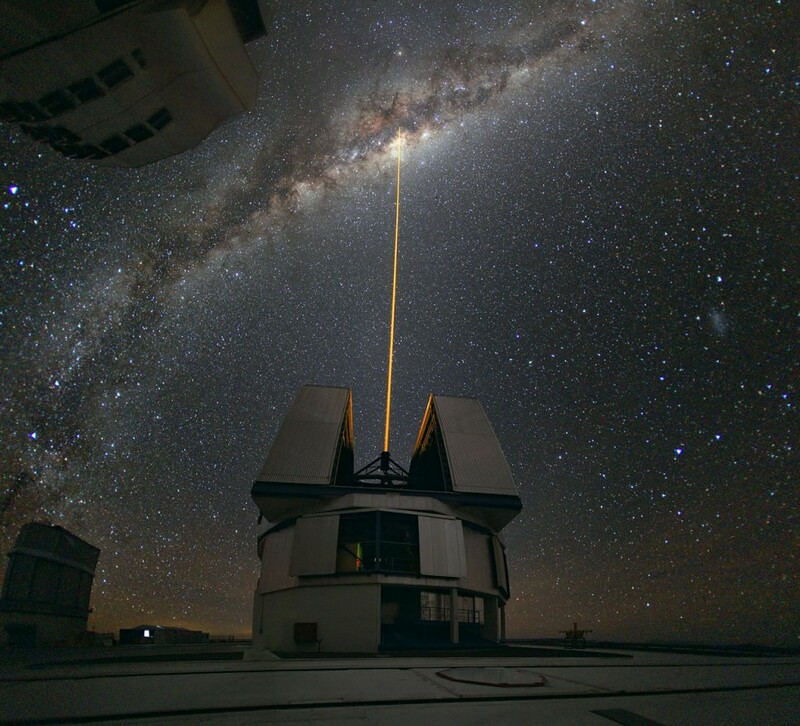 The wide-angle 180-degree image below shows a close-up of Yepun beaming a laser toward the center of the Milky Way, in this image by Yuri Beletsky. Beletsky lives in Chile, where he works for the ESO as an astronomer. Below is another time-lapse video by Stéphane Guisard, showing sunset to sunrise at Cerro Paranal. You can see the VLT sitting on top of the center mountain. 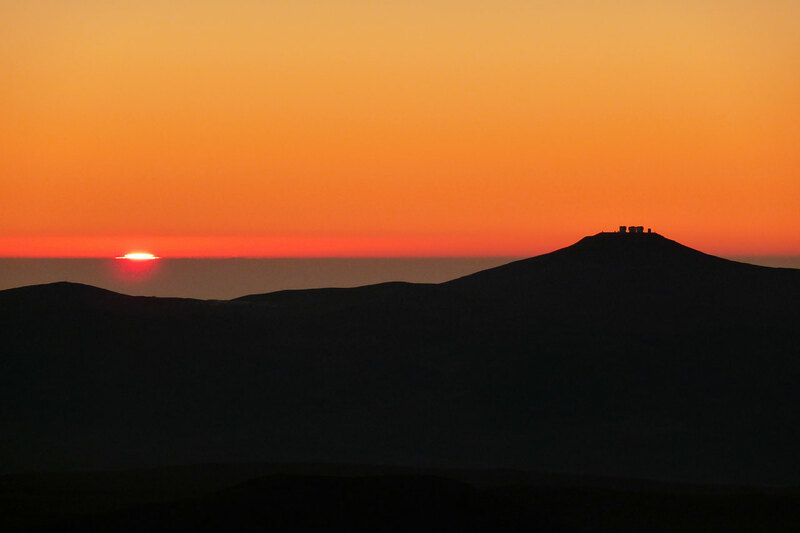 The stunning image below, taken by Gianluca Lombardi, also shows the VLT atop Cerro Paranal at sunset. Lombardi is an astronomer at ESO. 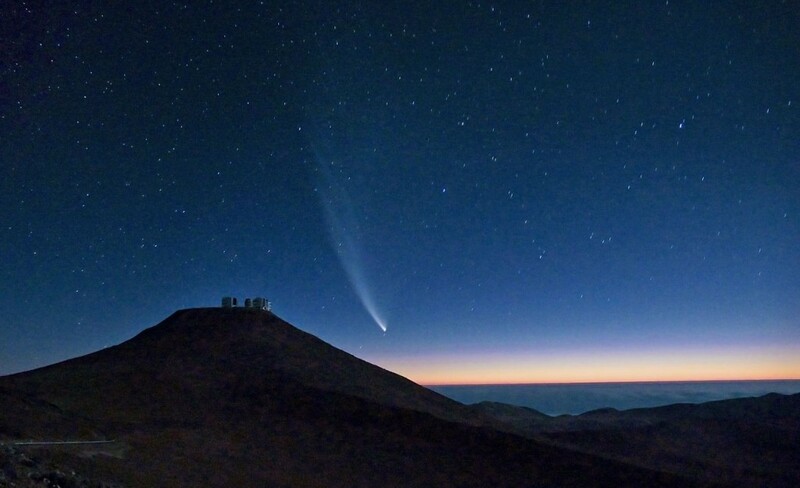 Gerhard Hüdepohl captured this image of Comet McNaught, which reached its perihelion in January 2007, setting behind VLT. In the background are clouds covering the Pacific Ocean, seven miles away. Hüdepohl works as an electronics engineer at the VLT and has traveled worldwide to photograph remote areas. In this video, as you watch the Milky Way setting at the ALMA Array Operations Site (AOS) on the Chajnantor plateau, look just above the antennas for an illuminated bulge, which is the center of our galaxy. Movement of the antennas is synchronized because, at any moment, they all point at the same target. Flashes on the ground are from the night watchman’s car headlights. This time-lapse video was created by José Francisco Salgado, an astronomer and science visualizer at the Adler Planetarium in Chicago. 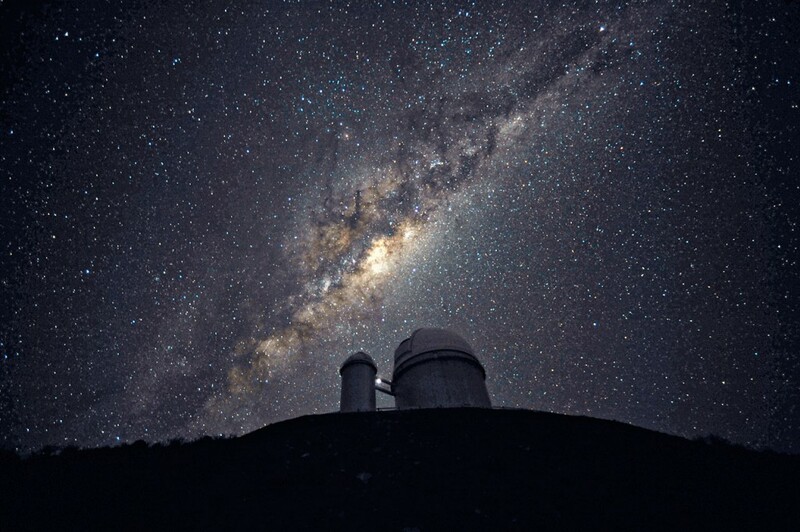 Another image of the Milky Way’s sparkling center — this one by Serge Brunier — shows the La Silla Observatory 3.6-meter telescope. La Silla has an altitude of 1.5 miles and was the ESO’s first observatory. Be sure to click on this image for an expanded view. Each year, the ESO receives around 2000 proposals for the use of its telescopes, making it one of the most productive ground-based observatories in the world. Among the ESO’s numerous amazing discoveries have been a detailed view of stars orbiting the Milky Way black hole, confirmation that the expansion of the universe is accelerating, and the first-ever image of a planet outside our solar system. The ESO Photo Ambassadors work to bring astronomy closer to people, via these sites in Chile. If you would like to find out more about becoming a Photo Ambassador, ESO will accept an email at osandu at partner.eso.org with some of your photos attached or a link to where they can find them. Holly Clark Coburn is a freelance editor and writer. She studied biology and art at a liberal arts school and received an MFA in creative writing.